Although Hurricane Irma ravaged a number of South Florida state parks, the good news is many of these facilities have been repaired and are now open for business. Such is the case with John Pennekamp Coral Reef State Park (www.pennekamppark.com), home to the world’s third largest coral reef. Although the park reopened shortly after the hurricane, some of the visitor facilities sustained extensive damage and needed additional repairs. That said, it’s thumbs-up for this park today, which is just as accessible as ever. Located near the beginning of the Overseas Highway across the Florida Keys, John Pennekamp Coral Reef State Park offers wheelchair-users and slow walkers an up-close-and-personal look at the undersea wonders just off the Florida coast. The visitor center — which sustained some hurricane damage but has been repaired — is a good first stop in the park. There’s barrier-free access to the building, and plenty of room for wheelers and slow walkers to maneuver around the massive 30,000-gallon saltwater aquarium inside. Filled with local aquatic residents, the aquarium includes a goldentail moray, a long-spined urchin, sea anemones, nurse sharks and the very colorful sergeant major fish. It offers a good primer on local marine life and it’s a must-see before you hit the glass bottom boat. Of course the highlight of a visit to this park is a trip out to the reef on the Spirit of Pennekamp. There’s level access out to the boarding area for this glass bottom boat, with ramp access to the first deck. Inside the main cabin there are two wheelchair spaces at the end of the aisle to view the “windows” on the bottom of the boat. Most passengers sit on one of the benches that line the windows, but you can get an equally good view from the wheelchair viewing area above. It takes about 45 minutes to travel out to the reef, and the boat spends about an hour out on the reef. During that time a marine biologist helps identify the fish that are visible through the bottom windows, and educates guests about the fragile marine ecosystem. It’s an educational and informative tour, and you really never know what you’ll see. And if you’d like to get a closer look at the reef inhabitants, accessible snorkeling excursions are available on the Encounter, which features ramp access up to the boat, tie-downs and an accessible head. The 2.5-hour tour includes snorkeling equipment, instruction, and assistance getting in and out of the water. The boat has one large step down at the aft end, and the usual procedure for wheelchair-users is to back the wheelchair up to the back of the boat, then transfer to the ground and scoot into the water. The captain is very experienced with wheelchair passengers, and his crew offers as much — or as little — assistance as required. 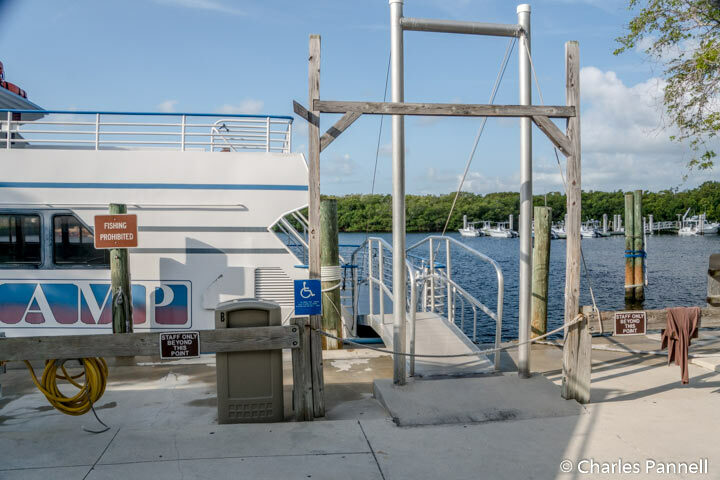 And thankfully both of these vessels weathered Hurricane Irma beautifully, so wheelchair-users and slow walkers still have plenty of options in John Pennekamp Coral Reef State Park soon. Plan a visit soon, so you can experience this diverse ecosystem for yourself!